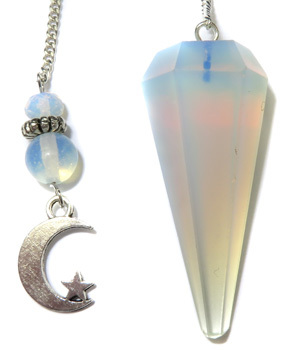 A faceted Opalite pendulum featuring an Opalite bead and a pewter celestial moon and stars charm. Comes with a velveteen pouch. Opalite: Man-made stone. Subtle yet highly energetic stone. Ideal stone for meditation. Improves communication on all levels, especially the spiritual. Removes energy blockages of the chakras and meridians. Emotionally helps by assisting during transitions of all kinds. Engenders persistence and gives us strength in verbalizing our hidden feelings. Helps us to be successful in business. All-round healing stone. Aids sexual prowess, enhancing sexual experience. Opalite stabilizes mood swings and helps in overcoming fatigue. Chakra(s): Third Eye.